There is no doubt: In social media the real success comes with interaction, communication and connecting. But sometimes when I look at some comments tweets or posts, I think the author should have kept quiet. Or in other words, the key to good interaction can sometimes be not to interact. Let me tell you about two cases when you should stay quiet. 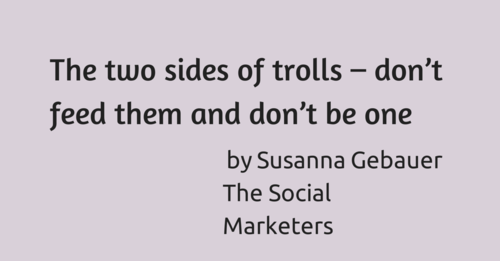 #1 – Don’t ever feed the troll. The above sentence should really be pinned to every single social media manager’s screen. Have you ever had a discussion where in the middle of the conversation you realize you cannot win no matter what you say or do? And the conversation turns rather weird no matter how hard you try to keep polite and objective? And then by sheer frustration you let it slip and make a sarcastic remark or something even worse. And now imagine this happens in written words, open for everybody to read even after years. I am sure we have all been in the situation where we have regretted some words we said. In social media they might stay visible for the world to read… and maybe you could have prevented this from happening by just biting your tongue for a second. 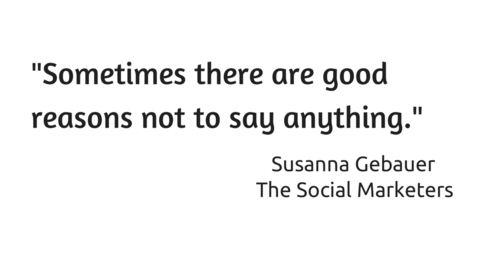 Sometimes there are good reasons not to say anything. And even some weirdo back door reason for a stupid comment or post can easily backfire multifold. Maybe nobody will care about a dumb tweet you made today – but it can’t hurt to think about what you are writing anyway… Here is an example I went through a while ago. Some time ago, I was attacked on Twitter by someone I did not know and had never talked to, without any obvious reasons with arguments that were easy to proof being wrong. Naturally I asked what was going on and tried to resolve the issue. I should not have done that. Obviously (as some twitter users and comments on my post covering the incident told me) this guy was trying to get a reaction from a large Twitter account probably to get a higher Klout-score. He did not really want a meaningful conversation and he did not care at all about my answers. I could not win – only lose. The guy deleted the conversation on Twitter, but you can find most of the conversation in my post on exploreB2B: “The Taming of Trolls”. I also have seen comments on blog posts or within LinkedIn groups, which I find more damaging for the one making these comments. Do not get me wrong, I love comments, they show that people not only read our articles, they also care enough to make the effort to respond! And I love a good argument: If you disagree, I love to hear your point, in most cases I will learn from it, even if we take a different view. But: If people do not have an opinion, no argument, nothing to add, only to beef and nag and justify their nagging with mentioning two misspelled words – sorry, I cannot take these people serious and they are not hurting the author (which they obviously intent to), they are only hurting themselves. So – don’t go running around correcting spelling mistakes on personal blogs, in LinkedIn groups, or wherever. You are in the social web, if you want edited content, go, buy a newspaper. And, really, this kind of comment kind of makes you the troll… because you are off topic and out of place. After all who wants to work with or connect to a nagger? In Social Media behavior is mostly public. Some people seem to forget that even though they are talking to strangers, their behavior will be noted by many people. The “anonymity” of the web is deceptive. Before we hit the “send” button we should take a step back more often and rethink how our comment might be perceived from others.